Orthodox Church liturgical Subdeacon clergy vestments (violet-gold) by Istok Church Supplies Corp. In need of sub-deacon vestments? You have come to the right place! 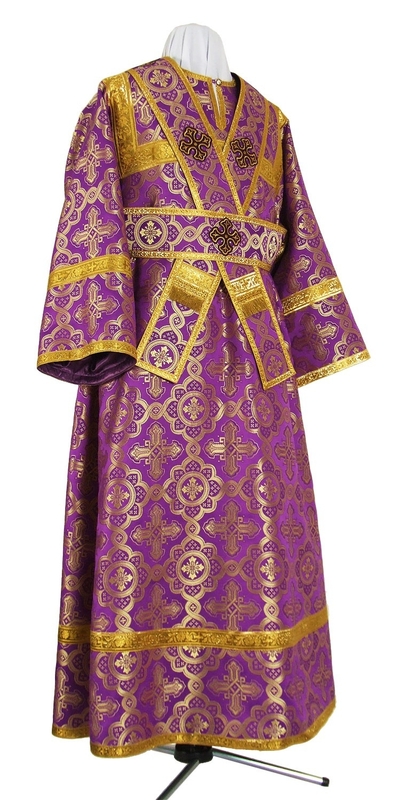 Istok Church Supplies offers a comprehensive range of high quality, traditionally styled Orthodox Christian liturgical vestments including Subdeacon vestments (violet-gold). A Subdeacon’s vestment is a reflection of his pride in his role and a symbol of the beauty of Orthodox worship. 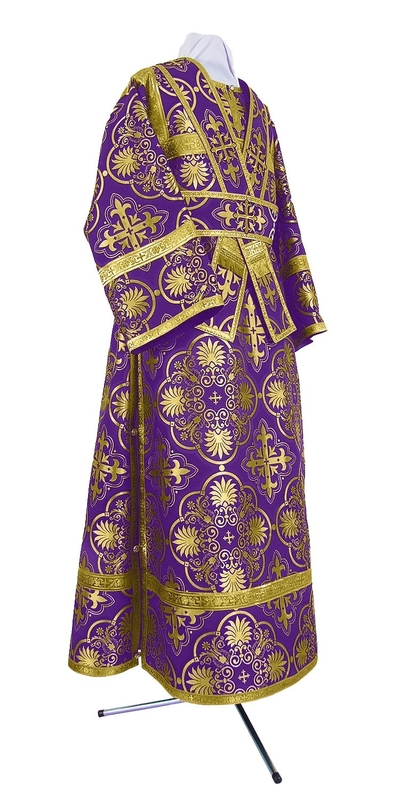 For our collection of Subdeacon vestments (violet-gold), customers can go through vestments made from either metallic brocade or rayon brocade. Both materials are attractive and long wearing – while rayon brocade is an economical option, metallic brocade is perfect for conveying luxuriousness. Our Subdeacon vestments (violet-gold) are ideal for underlining the mood during Lent. They are also worthy choices for celebrating feasts and days dedicated to the Cross of Our Lord. Each set consists of the two vestment articles prescribed for Sub-deacons – the sticharion and the orarion. Rest assured that there’s enough fabric for the orarion to be worn in the unique manner prescribed for Subdeacons. Our Subdeacon vestments are lined with 100% natural rayon and customers can upgrade their orders with quality natural velvet inserts. We offer three types of decoration – economy, standard and premium. Economy type is the default option that’s provided free of cost and it includes inexpensive trims and simple crosses. A step up is the standard style that includes quality galloon and embroidered crosses – this can be yours for an additional price. The luxury style consists of beautiful hand-embroidered crosses and solid jacquard galloon. Customers have complete freedom to select on the basis of their needs and budgets. We offer bespoke sub-deacon vestments custom-tailored to your exact measurements. Customers are requested to send in their exact measurements as per our online Measurement Chart so our ecclesiastical tailors in Europe can fashion perfectly fitting sub-deacon vestments in the right style. We require a few short weeks to execute custom orders, hence we request all our customers to place orders as early as possible. Whether for your Orthodox church worship or for gifting purposes, our sub-deacon vestments are an excellent choice!